Notes: a new hybrid created by me in 1996, by pollinating C. parviflorus with pollen from C. laurifolius. Described and named after me by Jean-Pierre Demoly. A very attractive plant, having the appearance of a compact C. laurifolius with pink flowers; now available commercially in France and USA. 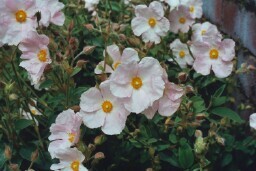 This hybrid appears to have inherited full hardiness from C. laurifolius and should be a good alternative to ‘Grayswood Pink’ for those wanting to grow a pink cistus in colder areas.